Justine's Cardmaking: Number 10 Shaker Card with Concord and 9th's Butterfly + Giveaway! Number 10 Shaker Card with Concord and 9th's Butterfly + Giveaway! welcome to Week 3 of my 1 Million Views Event - I hope you are enjoying all the video ideas so far! I was inspired recently by So Suzy Podcast to create a Number 10 Size card and I absolutely love the way Josefine's came out so I had to give it a try! It measures 4 x 9 3/4 when folded and it was the perfect amount of space to die cut the Butterfly die three times! Concord and 9th have donated a prize for my event and the details are below! Good luck everyone! Winners will be listed on May 1st when the event is over! What I think I love the most (aside from the pretty die) is the Butterfly Garden pack from Little Things from Lucy. She makes the most adorable shaker packs for shaker cards that include sequins, confetti, beads and various sized and shapes of sequins based on the theme of the pack. Thank you Concord and 9th for donating the Gift Certificate! Enjoyed your tutorial and will have to try making a number 10 card size. Great card! Fun to create a card of a different size. Love Concord and 9th products! Beautiful card! I love the shake butterflies! Smitten with, crushing on and swooning over your gorgeous C&9th butterfly shaker! I'm rather same old, same old with my cards - A2, side opening - but after seeing your 'long and lean' on here, I'm inspired to try something different! Hope you don't mind if I case this as a trial run...Another fantastic video! Thank you! I have never thought of making this size card before but now I definitely will. Thanks for the inspiration! I absolutely love this card idea I would love to see more of the larger size cards most people are not interested in the little tiny ones from a sales perspective. I love how you used different sequins and stuff in the shaker card. It's so cute! I really love this beautiful card. The die is so cool! That's a cute card !!! I have never made a card like this! Lovely! you make it look so easy. It turned out super cute. Love shaker cards. Butterflies are gorgeous. That is such a beautiful shaker card. I have made non-standard size cards before, and maybe I need to get out of the A2 size rut and make more, especially after seeing this beauty! Your card is lovely. I noticed the water color before I even noticed the shaker portion! I seem to only make A2 but this card makes me want to try this size! I have made non standard cards, the #10 as you show here and some 3x3 mini pop-outs that were fun. I really love yours and think I will borrow your design for my granddaughter's upcoming birthday card - it has so many of the elements I love - butterflies, watercolor prints (I will make my own watercolor background) and an out of the ordinary card size that is still easily mailable. Thanks for the inspiration. I have tried non traditional but only 5x7 and I love this die. And this card is gorgeous. Love your butterfly card. You make it look so easy! Such a beautiful card. I love the colour palette with the matching embellishments within the shaker card with the added dimension of the wings. Very inspiring! I shall try a card of this size myself soon! I've made gift enclosure sized Valentine cards. They turned out so sweet! Such a pretty card! I have not tried other size of cards other than A2 or the 5x7 cards. You definitely inspired me to try! Absolutely love this card. Definitely gonna give it a try. I love butterflies. Gorgeous card! I love the butterflies and the sequin mixes! I have made several other sizes of cards. I have made ones to fit into a regular sized envelope (#6 3/4), a business envelope like the size you made (#10), and an A7. I have also made various smaller sized cards and ATCs. Gorgeous card. I love the watercolour background idea. Beautiful butterfly direct. I'm did a shaker card last night( not as easy as you did this one) but I love shaker cards . I haven't made this size, but I do love to make all different sizes, depending on the purpose. I like to make matching envelopes too! Love this! And I'm not a fan of shaker cards, either! As for non-standard sized cards - no, I'm an A2 card maker so far ... :D Thanks for sharing this! What a great idea, love the size too. Beautiful card. In love with butterflies. Beautiful card!! I love butterflies! Beautiful way to use dies with a little extra flare! Shaker cards are my favorite, aspecially colorful ones like this!! ❤ my favorite card size is definitely the A2 because I find that it ships faster (internationally). However, I do love making square cards as well! Thanks for another great video, Justine! No, I usually make A2 cards. I plan to make one like yours soon. When I first started card making I made cards of all sorts of sizes because I didn't know there was a standard card size! Now I make standard size or 5x5 cards, I love the look of a square card. Your card today is amazing, I have the butterfly die from concord & 9th so I may have to case your card because I love it!!! Thank you for the inspiration and great video tutorial too. LOVE your shaker card! Butterflies are my favorite. I have made a couple of non standard size cards. really loving the Concord & 9th dies as I look thru what they have! Thank you for sharing! Love the card - great colors! Love this card! I have not used this die in such a way as a shaker, but I will definitely have to try it! I have made some A5 card sizes and square cards of different sizes, but never think to make a longer version, 9" seems awesome! Truly beautiful! I have tried different size cards and love the idea of having different shapes and sizes. I think the shaker card is adorable! Wonderful card! Thank you for sharing the inspiration! Beautiful, beautiful! I have not tried an oversized card. Now I have a good idea for cards for the no. 10 size envelopes I recently got at Tuesday Morning just because they were cute. Enjoy your vids. I have never tried a non-standard size card but this one is absolutely gorgeous and definitely worth a try. I love this card! I have the die from Concord & 9th and also got one piece of that paper from them. Is that pretty watercolor type paper available for purchase there or anywhere else? I couldn't find it on the website and don't see a link, so thought I would ask. Thanks for the chance to win! Wow - A very beautiful shaker card! I love the fact you added the butterfuly cut out pieces to the top of your shakers. This Concord & 9th Butterfly die is just beautiful. I also love the fact you made the different sized card. It looks elegant with the three butterflies across it. Thank you for sharing this video . Thank you Concord & 9th for your great items & for sponsering the giveaway! Beautiful card! I have made a few odd sized cards. Most recently, I made one that was 8.5 x 11. I needed it to be bigger so that there was room for a lot of people to sign it. I have also made mane, small cards, 2 x 3, mostly for quick notes or thank yous. LOVE this! Everything about it is just perfect! Would love to receive this card! I love the card. I've never made a #10 size card. I can't wait to try it and the butterflies are so pretty!!!! Unique card size which I love and using those colorful card bases was genius ! Cool ideas on different size cards I love it! I did make an abnormal sized card...i forget what size it was but, very long. How beautiful!! Thank you for making such an elegant card more approachable! I have never tried any unusually sized cards like this, but now I can with confidence! I love this shaker card Justine, it's so pretty. The recipient of this card would be so happy. Super cute card! I've tried the 5x5 cards. Thanks for sharing. Concord and 9th come out with the cleverest products! No I haven't tried a different size card, but after seeing this gorgeous card, I must give it a try!! Love it!! I've never thought about making this size card before, but love how it turned out, so may have to! Love those butterflies!! Sadly I can't enter your giveaway except for once, cause I don't know anything about Instagram, (and don't particularly want to) but...did want to let you know I'm enjoying your video's and cards! yes, many years ago. It was a #10, because that was the only size envelope I had on hand. lol. Such a beautiful card and thanks for the video ! I haven't tried making many cards it's on my craft lists of things to practice. I love this card. The butterflies, the water coloring, the shaker elements and especially the size. I have made this size card in the past and haven't done it in awhile. Thanks for inspiring me to make this size card again; I love the design with the 3 butterflies in a row. I love this card & have to have that butterfly! It is so light - airy! Love your blog! I have never tried a non standard size card before. I can't wait to try this! Thank you for the tutorial. Stunning card ! I love it ! So cute! I like the new shaker bits you shared, too. I am in love with butterflies-and this is a beautiful card. Looking forward to getting this set, and start creating! I do only standard size as I don't know any other size. But now that you have explained I different size, I will be trying it. Thank you for sharing this information. Your card is absolutely gorgeous. I absolutely love this card! I have tried other sizes but usually end up back at the normal size lol. what a great die cut butterfly! I really love that. I love the shaker fillings, too. Super cute card! Love the shaker fillings and how the butterflies are popping up! 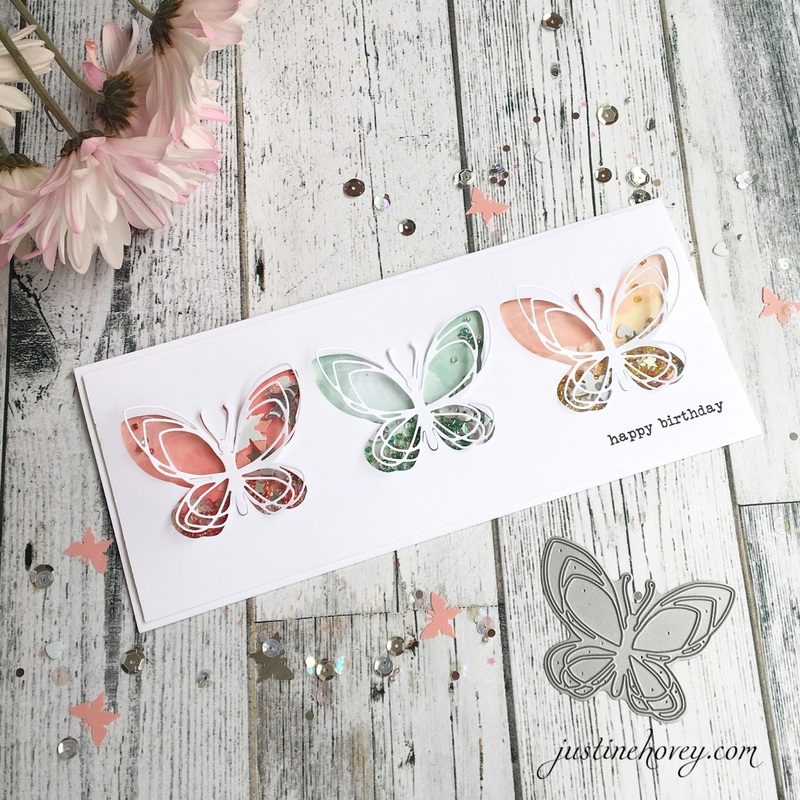 Your butterfly shaker card is so beautiful and adorable! I love it! Thank you for sharing your video on how you made your card. This is a beautiful die. Beautiful card. My Mom loved butterflies so this is extra special. I haven't made an abnormal size card because I don't make my own envelopes. I have started noticing that envelope makers are making all kinds of new sizes now so I can start branching out! I hope you don't mind if I case this card! It is so perfect! The size of my cards coincides with whatever envelopes I have in stock. Nine times out of ten, they are A2. Your card inspires me to explore other sizes and rethink the concept of handmade envelopes! What a pretty card...love how you added the butterfly die cut again at the end and let it remain raised on the wings. I have tried very small cards and also legal letter envelope size cards. Love your tutorials, thanks for sharing your talents. I usually make the standard size cards. Beautiful card! I love that Concord & 9th die! Your videos are always full of inspiration. WOWZERS Justine! That card is absolutely gorgeous!!!! I don't think I have ever tried a different size, thanks for the inspiration! Have not tried this type of card. I would love to create a shaker card! I love how you used this butterfly die. A very pretty card. What a beautifully delicate card!! Beautiful card! I love butterflies. I have tried a 5x5 card. It was when I first started making cards. You had to keep flipping and each side had a different image or saying. beautiful card! love the butterfly die! Love that you did a #10 shaker card. Very pretty. This is my favorite card using the florals and flutter die from C9. Love how soft and sparkly this is. So lovely! Wonderful card. I am always looking for #10 card inspiration. Great card, enjoyed the different size. Such a beautiful card! I have made some non-standard cards, both square and letter envelope-sized. I much prefer the standard A2 size. I absolutely love these butterflies!! So pretty!! I love trying different shaped/sized cards - different folds (gate fold, tri-shutter, box card) and bigger cards like the napkin fold, or half an A3 sheet to get a mega card! Beautiful card! I have not been very adventurous with my cards, but I have made circle cards. I've done special folds that compress to the standard A2 or 5x7, but no I haven't done anything outside of that. Wait, I take that back. I did some rectangular money holders a long time ago. Guess I need to switch up my game more often! Hey Justine, Absolutely LOVE this card!! If it' okay with you I would like to case this for my Mother's Day cards??!!! I have followed from your earliest posts and I will continue to follow as long as I am able!! Beautiful card! I love mixing little things from Lucy and pretty pink posh in my shaker cards also! Love the size card you've made, it looks very elegant! Great video. Love your card, butterfly cut outs really nice on card! LOVE this card! The extended size gives you such a nice space to create on! Love making cards in different dimensions. Always nice to change it up. I can't wait to make this beautiful card! This is a beautiful card. I need to get out of my box and try something new. I have used the Art Impressions guide to a trifold card. It was fun to try something different. I just came across your beautiful butterfly card and watched your video! Your card is lovely and that butterfly die is wonderful!! Thanks so much! Justine, I have this die bit never thought to line three up on non traditional size card. And then make it a Shaker! Love it! This is such a gorgeous card! I love the colours and what you did with the amazing butterfly die. I make square cards regularly and sometimes random dimension rectangle cards. Thanks for the chance to win. Shaker cards are soooo much fun. This one is especially beautiful. I love butterflies. The idea of placing the cut out die on the top is fantastic!! What a beautiful card! I will definitely have to try a card this size soon! I am sure I have tried but now I am not sure what size it was. this is such a pretty card idea. Absolutely stunning card! Definitely need to add this die to my stash! I have tried 6 X 6, 8 X 8 and number 10 cards before but always go back to 4 1/4" X 5 1/2" cards. Beautiful card. I love the delicate butterflies! Beautiful card. What could be better than butterflies and a shaker. This is a fabulous card! I haven't seen those dies and I love butterflies so thank you!! The video was great and so helpful. The three different Windows is such a cook look. I love this card so much I immediately ordered the die. I think some #kenoliver pattern color burst paper would be stunning behind those butterflies. Such a beautiful card! I made a 5x7 card once, when I was first learning and didn't know there was a "standard" A2 size. But I'm loving the idea of this size, especially for a card to be given in person! Omg i hope to win this fabulous card! I made a 6x8 card once for a poem I wrote for my brother when his wife died (she wad only 36) and had a 3 year old. I love this card and your use of the beautiful die! Love your card. Beautiful Butterflies! I've tried all different sized cards. When i first started my cards were all BIG cards, I didn't know anything about your standard card sizes until i started watching youtube. Hi Justine!!! Such a stunning shaker card!!! Really cool!!! I've never tried a non-standard size card but after seeing your amazing video I'll try it!!! Years ago I made some lovely square cards, but I haven't ventured beyond a standard A2 size since then. The card you're sharing with us today may change all that! YOur ?utterfly Card is GORGEOUS....you definitely did a Super Outstanding Creative job!! the size card I made was a 4 x 9-1/2. To create scene cards love it because they fit in a #10 envelope. Thanks for the chance to win an fab gift certificate!! YOU ROCK!! Love today's butterfly shaker card and the size is perfect for it! I have not tried a nonstandard size card. Love this card and congrats with your blog, you're so talented! Love this card!! I have dabbled in non-standard sizes a little. I really like to make square cards. Great ideas! I love different card sizes! Beautiful card. I've occasionally made non-standard card sizes, and I sometimes try things like z-fold cards to add a bit of extra interest to a card. When I do non-standard cards I love to make square cards. I have never tried anything like this! I absolutely love this card! I pinned this one but don't know how to paste in URL. Sorry! Super great card! Looks super cool! I love square cards! Awesome card. So far I have not tried different sized cards. I am going to do some experimenting after seeing your card. Good job. I'm totally CASEing this! Thanks for the inspiration! Love the long butterfly car and the sequins ar so pretty. Such a pretty card. I love shaker cards, and using the butterfly die is a great idea! Such a pretty shaker card, I really like the way you used a different card size, it really emphasizes the butterflies, TFS. Terrific card! I like the way you used a variety of materials for the shaker. Clever! I absolutely love this card. I will definitely give this one a go. Thanks for the inspiration. I have only made A7 cards in the past and now just A2 cards but you 10 size card was the first one I have seen other than store bought cards. I just loved your idea with the butterflies. Just a beautiful card. Sometimes mes I like to make mini cards especially for the kids! I usually stick to an A4 sized card but this card I really love. Might have to give a new sized card a try! Thanks for the inspiration. This card is so beautiful! Thanks for sharing. I always make standard card sizes. This is a gorgeous card, and I also love Lucy's Little Things sequin mixes. I like shaped cards, so they may not be super tiny or really big, but unusually shaped! I think the only nonstandard-size card I've made is a square. Then I found out they cost more to mail! But it's fun to do other sizes. 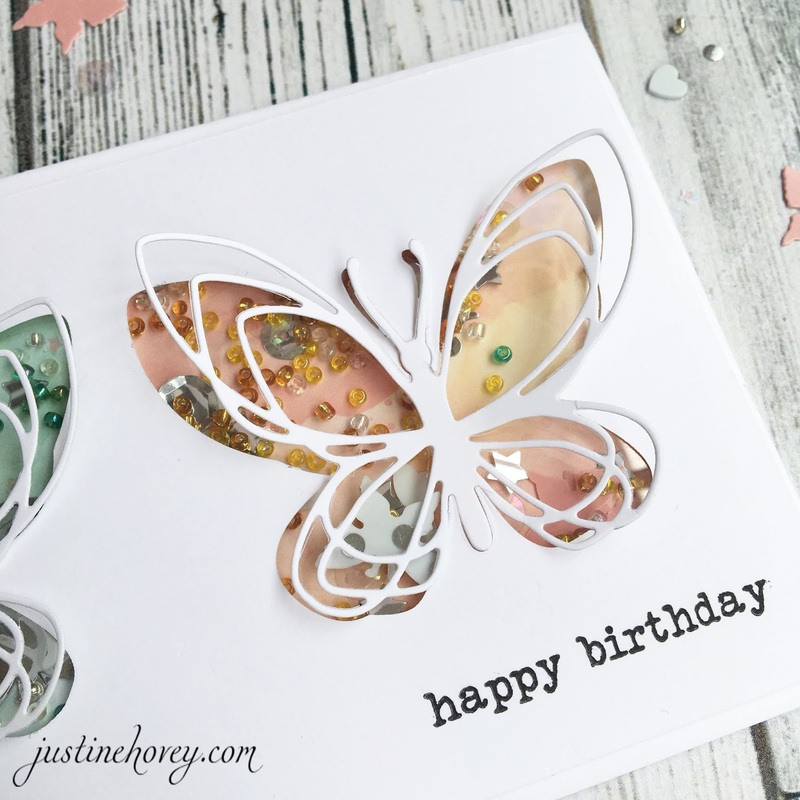 Your butterfly card is stunning, and I really enjoyed your how-to video! Thanks for the video. I have not tried this size as yet. Beautiful! Love the shaker element. I've made mini cards (3 by 3) and one oversized card for an office group to sign that was definitely non-standard as I had to make my own envelope.